Cailleah Scott-Grimes’ documentary, <em>She Got Game</em>, will be shown at RIT’s MAGIC Center Sept. 21. The filmmaker, pictured here, will host a Q&amp;A following the screening. Filmmaker Cailleah Scott-Grimes is a self-described “perpetual asker of big questions” and works on either side of the camera seeking to shed light and humor on the human experience. Scott-Grimes will appear at Rochester Institute of Technology’s Center for Media, Arts, Games, Interaction and Creativity, Student Innovation Hall, from 4 to 6 p.m. Thursday, Sept. 21. Scott-Grimes’ 2015 award-winning documentary, She Got Game, will be screened; a Q&A session will follow. The event is co-hosted by RIT’s MAGIC Center and the School of Individualized Study. 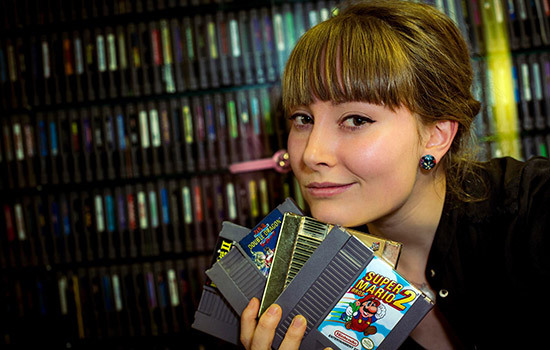 She Got Game, winner of Best of Fest at Fan Expo Canada and Best Documentary at the Imaginarium Festival in Kentucky, is the story of a young woman searching to reconnect with the world of video games. Once she had loved that world, but it seemed to be made by men, for men. Fed up with media buzz treating women only as victims, she wants to understand what keeps women gamers going. How are they carving out space in the industry? What are their sources of persistence and resilience? From Toronto to Montreal, New York to Tokyo, she talks, plays and works with women who are reinventing the ways people think about games and the social climate. The would-be gamer is herself changed as she tackles questions of free will, community and what it really means to be heroic. A graduate of the University of Toronto’s Visual Studies and East Asian Studies programs and a recipient of the Canadian Millennium Scholarship, Scott-Grimes is said to “bridge cultural, social and technological gaps through art and film.” She is also a guest lecturer at high schools and universities and urges young women to trust their personal narratives and create media that reflect their own experiences. For more information about the film screening and talk, go to magic.rit.edu.